Since the launch of Big Bang in 2005 - of which we celebrate this year the 10th Anniversary- "Art of Fusion", representing rebirth, creation and renaissance, has always been the philosophy of Hublot. “Hublot Loves Art” now witnesses an unprecedented mind-blowing new interpretation. 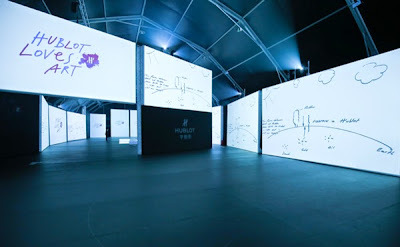 On April 30th 2015, Hublot held hands with "Van Gogh Alive" as its official partner. This partnership not only manifested the extraordinary courage of the brand yet again but also represented another significant milestone of the brands adventure in the world of art. 2015 sees the 125th anniversary of Vincent van Gogh's death. The whole world is paying tribute to this major post-impressionist painter one way or another. Thus, "Van Gogh Alive" was born. After its tour around the US, Italy, Russia and Israel, the exhibition is now landing in New World Taiping Lake Park in Shanghai. "Van Gogh Alive" features the SENSORY4™, the multimedia cybernetic technology with 40 HD projectors; multichannel video and cinema surround sound system. It presents an unexpected interactive experience, challenges traditional way of appreciating arts and fuses traditional art and modern audio-visual to the extreme. The minute when more than 3000 masterpieces unveiled with flowing music, the whole site transformed into a palette of lights, colors and melody, a 360 degree feast of art. Everyone, including guests from art and fashion, was simply stunned, amazed. "Van Gogh Alive", a phenomenal exhibition, is presented by Grande Exhibition, one of the top exhibition organization in the world. Inspired by works and the life of Vincent Van Gogh, it showcases classics in a timeline and reproduced art with space, interpreting "Hublot Loves Art" in the best possible way. Mr. Loic Biver, Hublot General Manager of Greater China, said on the launch press conference, "we are honored to partner with "Van Gogh Alive". This has given us a precious opportunity to reproduce timeless classics with innovation and witness the homonymous coexistence of traditional and modern elements. This partnership is the perfect demonstration of fusion. It blesses "Hublot Loves Art" with brand-new life with brilliance that the world has never seen." 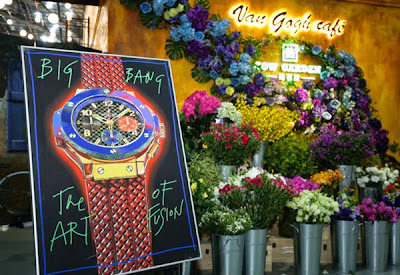 Hublot & Van Gogh Alive: pay homage to tradition by bridging the past and the future "We don't break the past. We bridge the past and the future to pay tribute to tradition!" This is how Mr. Jean-Claude Biver, the soul of Hublot, interprets Hublot's mixed passion for tradition and innovation. In Ricardo Guadalupe’s mind, CEO of Hublot, “when master watchmakers meet art pioneers, timeless classics meet creative minds, flowing time meets space full of possibilities, "Art of Fusion" is an irreplaceable process, triggering the ultimate reflection on the past and the future, tradition and innovation and creating a classic of the future." Vincent Van Gogh was an extraordinarily talented art pioneer. Bright colors and lively details are the key features of his works. He abandoned everything he learnt and ignored all the doctrines valued by the academism. Instead, he injected all his truest emotions into his works, courageously adventuring in the world of art. It is the warmness and honest infused in his works made his pieces timeless classics. His works, including The Starry Night, Sunflowers, Portrait of Van Gogh and Wheatfield with Crows, to name but a few, has deeply influenced western fine arts all though the 20th century. "Van Gogh Alive" showcases these masterpieces in a timeline fused with soul-shaking classical music. His works unveils in an unlimited art space, telling the story of his stumbling life. Immersed in the space, audiences will see master level paintings but will feel his belief in art that he had pursued all through his life: art is about people, about their life, about exploring conscience, about changing the world. Fusion of art and reality is passed on for generations in paintings and creates classics. And today, these classics are manifested via modern technologies, paying tribute to tradition. Since established in 1980 in Nyon, Switzerland Hublot features natural rubber strap with valuable materials and created a first in the history of watchmaking. Hublot boldly fused innovative technologies into watchmaking, presenting world changing modern designs. Iconic series, including Big Bang, Classic Fusion, King Power, Manufacture Pieces, exemplify unparalleled spirit of pioneering. "Art of Fusion" does not stop here. It shines far and beyond. The magical power generated by the clash of different materials, fields and spirits creates tolerance and coexistence. The exquisite traditional watchmaking of Hublot collaborates with the quintessence of art once and once again, creating a fresh bond between luxury brands and art. With the philosophy of tolerance and fusion, classics of the future are born.